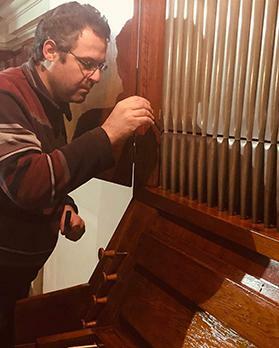 A fine Danish pipe organ that needed a home caught the eye of local organ builder and restorer Robert Buhagiar, who was terribly keen on bringing it to Malta. Robert Buhagiar at work voicing a facade pipe at Senglea Oratory. 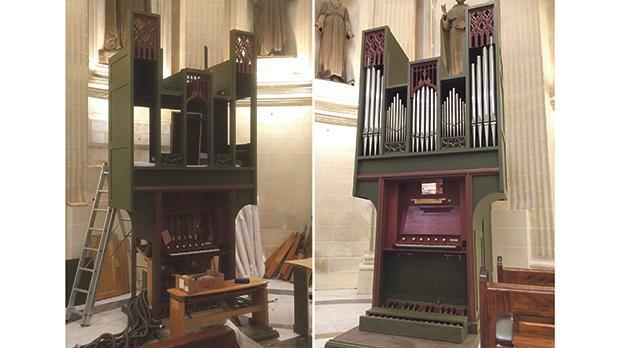 Above: The Frobenius pipe organ during and after its installation at Sliema. “Its design is elegant and features wood carvings on the front. Its builder – Frobenius – was and still is a top-class organ-building firm of worldwide reputation. Buhagiar saw this gem as an addition to local organ heritage. It is the first Frobenius organ in Malta, with only two other Danish organs, also relocated by Buhagiar. “Getting a Frobenius to Malta is like obtaining a valuable item of cultural heritage. This motivated me a lot,” says Buhagiar. He recalls how it all started just over a year ago after he received an e-mail from a friend in Denmark, informing him that a Danish church had a beautiful pipe organ which needed a new home. This organ was not suited to the very dry acoustics of the Danish church and so there were plans to replace it. “However, the Danish authorities insisted that the current pipe organ must be relocated to a new ‘home’ (the organ could not just be removed and discarded due to its fine quality),” Buhagiar explains. He was asked whether he was interested in relocating this organ to Malta. In 20 years of uninterrupted organ-building, Buhagiar has relocated about 10 pipe organs from various countries to Malta, apart from carrying out more than 20 restorations of local ones. He immediately went to Denmark to inspect the organ and confirmed it was indeed a fine one – not just because of its builder and design but also, upon inspecting it closely, “it was evident that the organ was very finely crafted using excellent materials. Being a one-manual and pedal instrument with six stops and nine ranks of pipes, it was intended mainly as a liturgical instrument but can take on a varied organ repertoire too”. Although built in 1944, it was still in a pristine state of conservation and enjoyed “an excellent bill of health”. At that time, the founder of Frobenius, Theodor Frobenius, was still at the firm’s helm, giving this organ more historical significance. After making some inquiries, Buhagiar found out that the Dominicans in Sliema were eager to take this instrument – on condition that a new home would be found for their own pipe organ, a four-stop, one-manual ‘positiv’ enclosed in a bureau-style oak case built by the prominent German firm Oberlinger and which Buhagiar himself had installed some years earlier. Since Senglea parish was interested in having an organ installed in the Oratory (where the devotional statue of Christ the Redeemer is located), APS Bank stepped in to make it (financially) possible for the ‘positiv’ organ of the Dominican Priory in Sliema to be relocated to Senglea Oratory. The Oberlinger organ turned out to be a perfect fit both physically and tonally. Then last summer Buhagiar visited Denmark again and, together with two Danish friends, carefully dismantled the organ in three days. It was loaded on to a six-metre container and shipped to Malta. The organ was installed in Sliema last month. This took about four weeks, mostly due to the time and effort spent on obtaining the best timbre (a process called ‘voicing’) from the almost 500 pipes of the instrument, which range from 1.5 centimetres to 2.4 metres in length. “It is a fine instrument from all aspects – design, builder, materials, craftsmanship; also tonally and mechanically,” says Buhagiar. Asked whether it made sense to buy and relocate an existing pipe organ, Buhagiar said that a pipe-organ wasn’t like an appliance – once it gets old it is thrown away. When well made, a pipe organ is a work of art and can last for centuries. The Frobenius organ at the Nazzarenu parish church in Sliema will be inaugurated with a recital by John Aquilina, organist emeritus of the Mdina Cathedral, on Friday at 7.15pm. Entrance is free of charge.